Act! Training: Don’t Lose Touch! We all know that maintaining relations with our contacts is a critical part of turning prospects into customers and customers into loyal fans. It is so easy with CRM functionality such as Act! to keep all the information we have on our customers, prospects, and suppliers in one easy place, such as calls we have made, appointments we have scheduled, or, of course, e-mails. This is in addition to information such as opportunities or targeted marketing to help us sell more of our products or services. As our customer/prospect base grows and we start to get busy, it is easy to forget about past customers and focus on new business. This tip gives us a quick way to locate contact who have fallen of the radar due to inactivity. Conversely, we may want to locate contacts that we have been actively working with so we can maximise our marketing effort to close those opportunities. 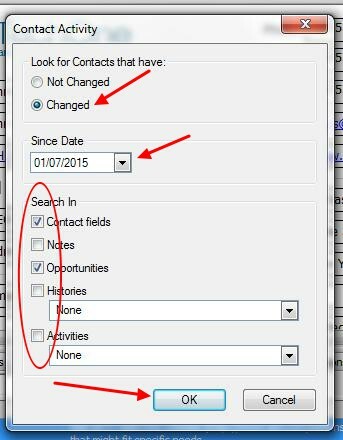 To locate Contacts or Opportunities that have been modified recently or those that have not been worked on lately, we can use the Lookup feature in Act! to find Contacts, Opportunities, Notes, Histories, and more based on a modification date. After locating our contacts or opportunities, we can focus on re-engaging these contacts (in the case of inactive contacts) or increasing our marketing efforts to close sales with active accounts. 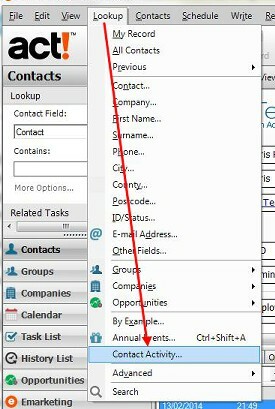 Click on the Lookup Menu and select Contact Activity. In Look for Contacts that have:, select Changed. In Since Date, choose the start date for the update period you want to search (the end date is today’s date by default). In Search In, select one or more data areas to search (Contact Fields, Notes, Opportunities, Histories, and/or Activities). If you choose Histories or Activities, also specify one or more events to use in the search, or All to include everything in the data area in the search. Click OK to look up records based on the selected criteria.